In its sixth year, the City of Swan competition encourages young people to talk about issues important to them while building their public speaking skills. 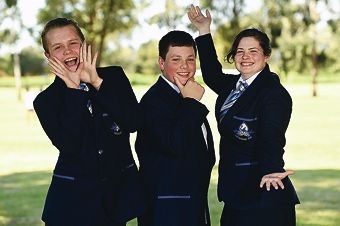 Lockridge SHS Year 8 student Connor Pike won the junior category for his speech on bullying, while Year 12 school captains Utariah and James Clarke were first and second in the senior category for their speeches on inter-racial racism and sexual identity. Connor, who was bullied in primary school, said taking part in the competition boosted his confidence and encouraged him to speak out about bullying. ‘It feels horrible to be bullied and no one should have to go through it,’ he said. Like Connor, Utariah drew on her own experiences to write her speech after being judged as an Aboriginal girl by Nyungar people for ‘being too white’. The Beechboro teenager said hearing she was judged by her skin colour made her feel unworthy and upset. ‘I felt angry as well but I didn’t want to be angry because it’s within my mob, my own people,’ she said. ‘I get it from the white community as well, ‘you should be black’, ‘why would you even choose to be Aboriginal’, it’s very confusing at times’. Caversham Primary School students also did well in the junior category with Rhythm Reid being placed second and Eli Baijnath third.